Bemidji State’s upset win over then-No. 1 Wisconsin last weekend could not have been more typical of the Beavers: a low-scoring game, quality goaltending, and a mass of dogged BSU defenders clogging up lanes in front of the net, all of which frustrated a normally potent, top-ranked team. But the victory was also notable, and perhaps even more fitting, for another reason. With the 2-1 win over the Badgers, fifth-year head coach Jim Scanlan tied former coach Steve Sertich for the program record in all-time wins with 81. Scanlan isn’t willing to take personal credit for the achievement. Instead, he directs it towards the players that have come through the program in the last five years, his assistant coaches, and the entire team staff. It’s worth noting that Scanlan reached 81 wins 113 games faster than Sertich, his predecessor. Under his guidance, the Beavers have recorded single-season records for wins (originally 21 in 2014-15, then 22 in 2015-16), hosted their first-ever WCHA playoff series, and appeared in the WCHA Final Face-Off championship game for the first time. The team’s 2015 playoff run in his first season is dotted with a few wins that stick out the most to Scanlan. That year, Bemidji State knocked off Minnesota Duluth in overtime to finish off a three-game quarterfinal series on the road, and then upset Minnesota 1-0 to play for the WCHA championship and a berth in the NCAA Tournament. The team came up short in that final game, but it’s still a moment he cherishes. In the WCHA, Bemidji State routinely faces off against top-10 teams with plenty of resources, namely Big 10 schools like Wisconsin, Minnesota, and Ohio State. It’s unsurprisingly difficult for a smaller program like BSU to compete with those teams, but the Beavers are no stranger to playing spoiler for them. This season alone, one in which Bemidji State is not at .500, the Beavers have knocked off the Badgers, swept Ohio State, and defeated Minnesota Duluth, all teams ranked within the nation’s top-10 right now. Scanlan attributes these kinds of results to more parity across all of college hockey, and the quality of players in the game on every team. Scanlan has a few personal ties to Bemidji State and the community as a whole, making the last five years extra sweet for him as a coach. He and his wife, Cyndy, are both graduates of BSU, and his daughter, Briana, played soccer for the Beavers. His son Joey also worked in Bemidji State’s athletics department. “Just to have the opportunity to come back and coach at this level in this league with Bemidji State was an incredible opportunity, and I’m just really blessed to have been given the opportunity to do it,” he said. Prior to his tenure with the Beavers, Scanlan had plenty of coaching experience under his belt. 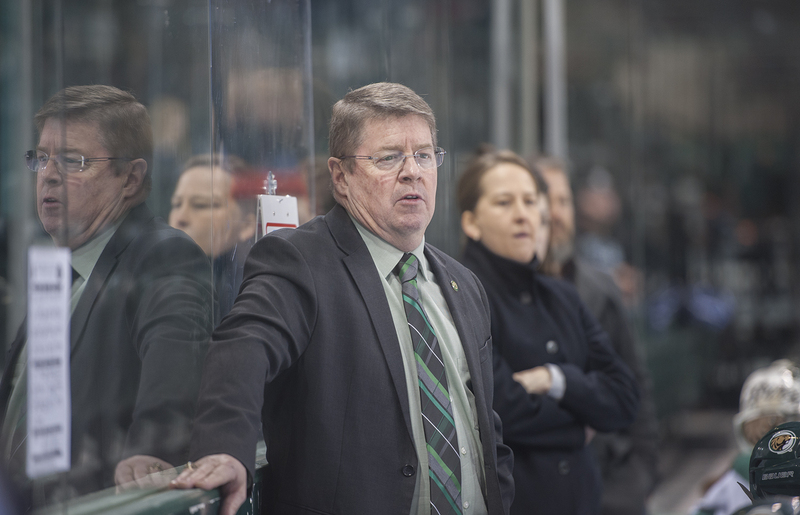 He headed the East Grand Forks High School boy’s hockey team for nine years, then the Green Wave girl’s team for six, and before that, coached within the men’s college game for 12 seasons. But the last five years at Bemidji State have assured him of the importance of building relationships in hockey, and creating a good experience for the players. Taking down the No. 1-ranked team is undoubtedly a bright spot, but this season hasn’t been smooth sailing for the Beavers. The squad started off 0-9-1, and had to overcome some adversity to get back on track. The team now sits at 10-16-2, and Scanlan says he’s been impressed by how his team stuck together despite the tough start. “We’re all competitive and the players are as well, but they never once showed any signs of finger-pointing,” he said. “They’d come to the rink every day with smiles on their faces and just go out and work hard. According to Scanlan, the Beavers have made some nice strides, particularly offensively. He likes what he’s seeing from his team defensively, too, and just wants to see the group hit a peak by the time the WCHA postseason rolls around.